Each time we leave Patience, we imagine we’ll be back sooner rather than later. We imagine it might be just a few months, certainly not years. This time we arrived back on the boat having been away for longer than we care to admit to find an interesting array of groceries in our store cupboard. The question is always how to incorporate the sometimes beyond their sell-by date ingredients into delicious meals. Some things languish, others prove irresistable. 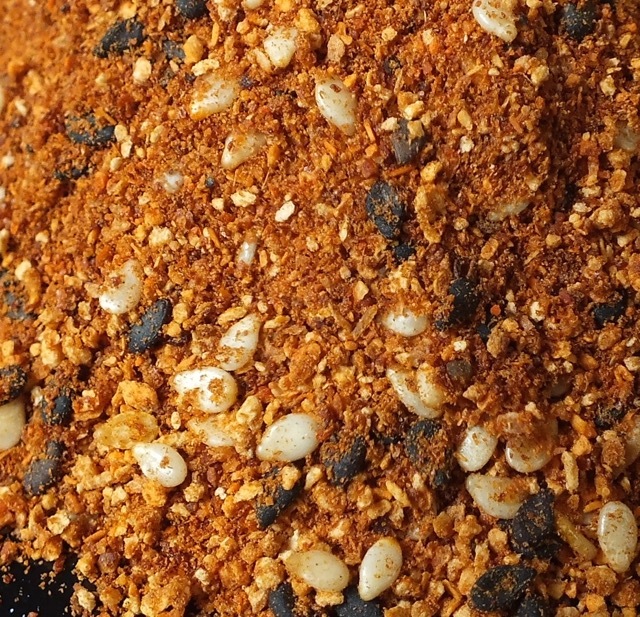 The star of the show this week has been the togarashi seasoning. We have used it on everything. Richard has whipped up fabulous breakfasts every day this week. 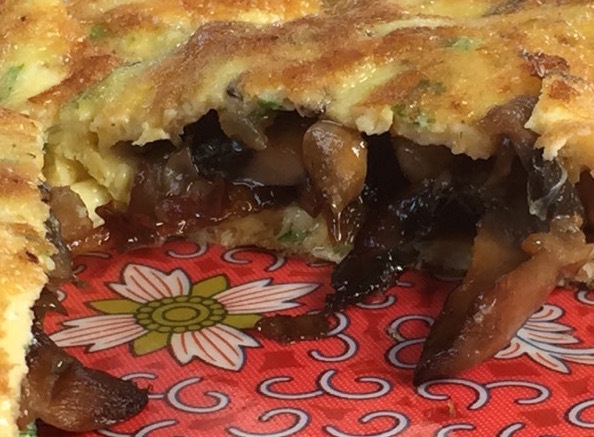 He’s specialized in eggs with togarashi seasoning: frittata with red pepper and togarashi, scrambled eggs with stir fried vegetables flavored with togarashi, an omelette filled with mushrooms, onion and togarashi and coddled eggs with togarashi seasoning. I’ve been in charge of the suppers all of which involved togarashi seasoning. You’d think we’d have overdone it but that’s not the case. Addicted? Possibly. But addiction wasn’t our biggest problem. Diminishing supplies of togarashi were. 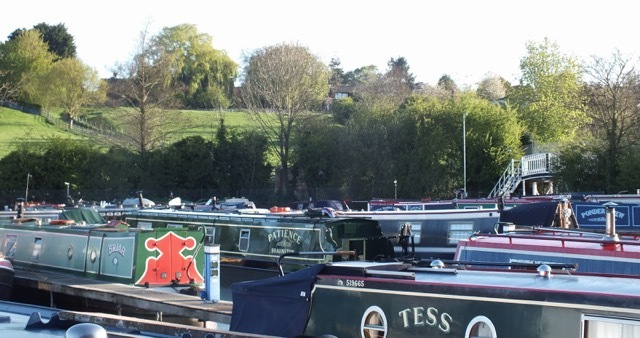 I decided I’d better stock up before we left Braunston for the start of our journey so I made a special trip by bus to the nearest branch of Waitrose in Daventry. I dashed in and marched down the first aisle after the fruit and veg section and was pleased to see a massive section of exotic ‘Waitrose Cooks’ Ingredients’, the array of jewel-coloured labels as familiar as the togarashi seasoning label. Squares of bold color with simple black text. 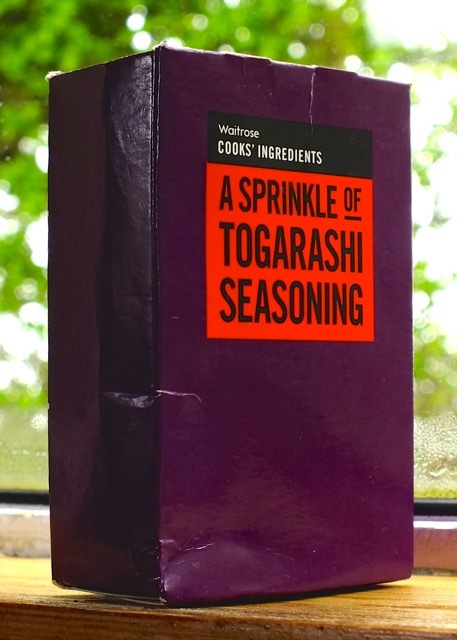 Hooray – in a few seconds I’d have the box of togarashi seasoning in my hands and I’d be on the bus back to Braunston. The line up of ingredients was impressive and tantalizing. They had everything any cook could possibly want from ancho chillies and black bean sauce to nam pla fish sauce and tamarind paste, from yuzu juice to za‘tar. How tempting. I wasn’t, however, here to stock up on every exotic ingredient on the planet. I just wanted a 40 g cardboard box filled with togarashi seasoning. So I scanned the shelf just for that purple box with the orange and black label that I now knew so well. They had a five spice blend, an Italian mix, a smokey steak rub and a spicy Thai mix. But no togarashi seasoning. I scoured the shelves. Nothing. Well, too bad. I went back to Patience without the main aim of my shopping expedition accomplished. Since then I’ve been trying to use some of the other store cupboard surprises. 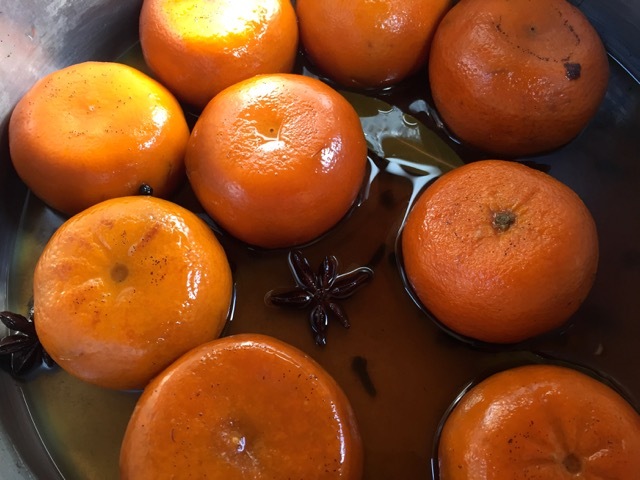 I’ve just incorporated a jar of sugary honey and all manner of spices as well as some cognac in a steaming cauldron that has perfumed the boat and made us happy. I know we won’t be eating togarashi anything tomorrow. 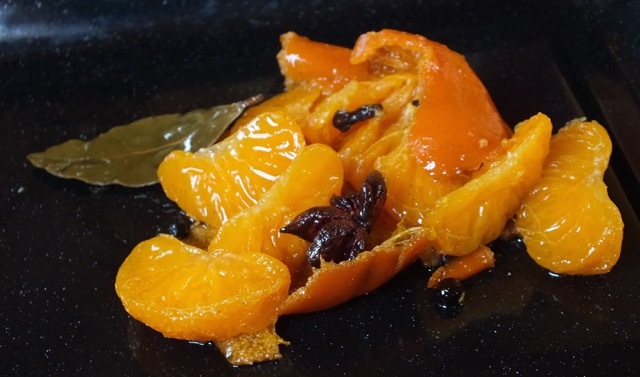 Pierce each clementine three or four times, place in a pot and cover with water. Bring to the boil and boil for fifteen minutes. Drain and set aside. Bottle in sterilized jars but keep in the fridge and use within a couple of weeks. I don’t think these will keep too long. Delicious with cheese. We have had them with feta, cheddar and Gruyère so far. I’m thinking about having them with yoghurt for breakfast and perhaps I’ll add some chopped walnuts. I’ll post some to you if I find it. It IS delicious. Just had it on avo with lemon for lunch.